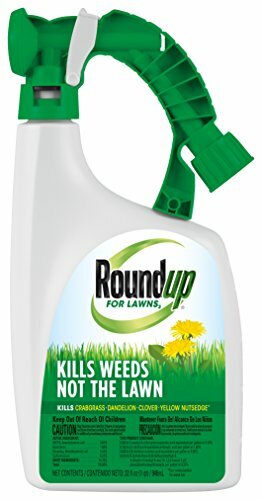 Roundup For Lawns 3 is a formula that kills weeds, not the lawn! It controls over 250 common lawn weeds, roots and all, and is especially effective on hard-to-kill weeds such as crabgrass, dandelion, clover and yellow nutsedge. The ready-to-spray applicator is great for broadcast application to your entire lawn and covers up to 5,000 square feet. This fast acting formula starts killing on contact and kills weeds down to the root so they don't come back. In addition, its rainproof in as little as 3 hours! Roundup For Lawns 3 is a simple step towards a beautiful, weed free lawn. Roundup For Lawns 3 Ready-To-Spray works great on your lawns, and even better in combination with Roundup Weed & Grass Killer Concentrate Plus to kill weeds in your non-lawn areas such as sidewalks, patios, driveways and garden beds — for weed killing solutions all around your home. Kills the root. Guaranteed* *Consumer Guarantee: If for any reason you are not satisfied after using this product, simply send us original proof of purchase, and we will refund the purchase price.